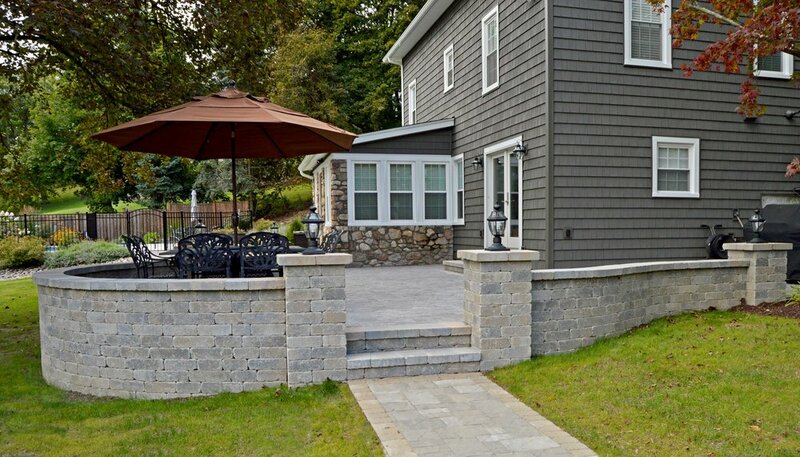 Skillfully constructed with the Unilock's Brussels Dimension System, these custom-tapered stones encase a spacious, elegant outdoor dining area for lounging and hosting. The wall's intricately designed curve flows with the natural shape of the yard while providing ample space for traveling throughout the dining area. The softly toned wall materials blend with the countryside landscape, adding an additional level of style to the structure. As guests explore the backyard and prepare for dinner, CST pavers line the patio, from the border of the home to the steps and walkway. In the evenings, a balanced lighting design safely welcomes guests to enjoy a summer evening around the table.